I have three children and they were all born as very special presents to me. Jonathan, my oldest, was born in July, and I took him home from the hospital on my birthday. Kerstin, my middle child, is a February baby, and I took her home on Valentine’s Day, Chloe, my baby, was born on Easter Sunday. All three had their favourite birthday cake which I always handmade for them. For Jonathan it was usually tiramisu, for Kerstie, it was fruit flan, and Clover wanted black forest cake. But it’s still February, so we will focus on Kerstie’s birthday and and I’ll tell you what I used to always do for her. Kerstie’s favourite flowers are violets; so much so that she named her middle child Isla Violet, and, here in the West Coast, they come up around her birthday. As a special treat, and if spring was threatening to be late, I used to cover and force a few buds, pick them, and candy them to add them to her birthday cake. So it’s been years since my girl has been home for her birthday…she’s the mom of my three precious granddaughters and rather busy these days, but because it’s February, and because it’s tradition, I decided to candy some violets anyway for the next time I see the gang. So here we go, this is all you have to do: Grab some violets from the garden. 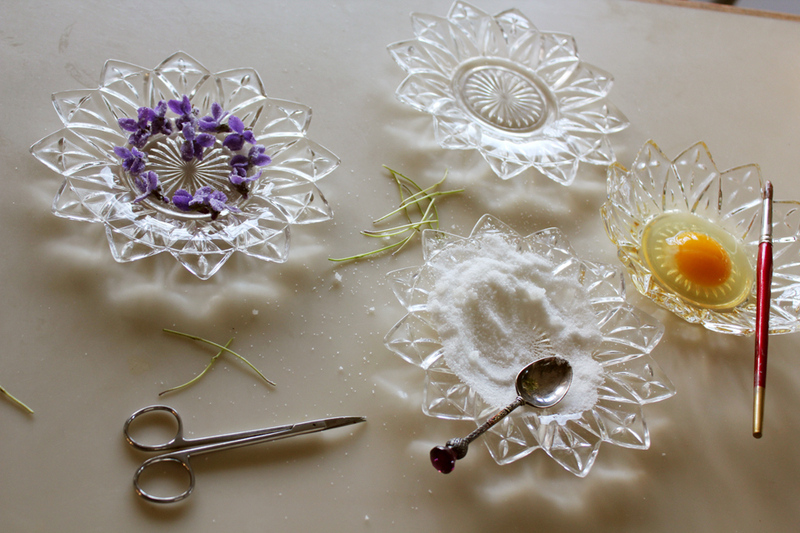 Equally easy to do this with violas, pansies, rose petals, borage, calendula…the list goes on. Grab a very fresh egg, and some super fine sugar. Grab a small paintbrush and your manicure scissors. You only use the egg white, but what’s the point of separating the egg for the infinitesimally tiny amount you use? And, besides which, you’re going to scramble that delicious egg for breakfast tomorrow anyway, aren’t you? 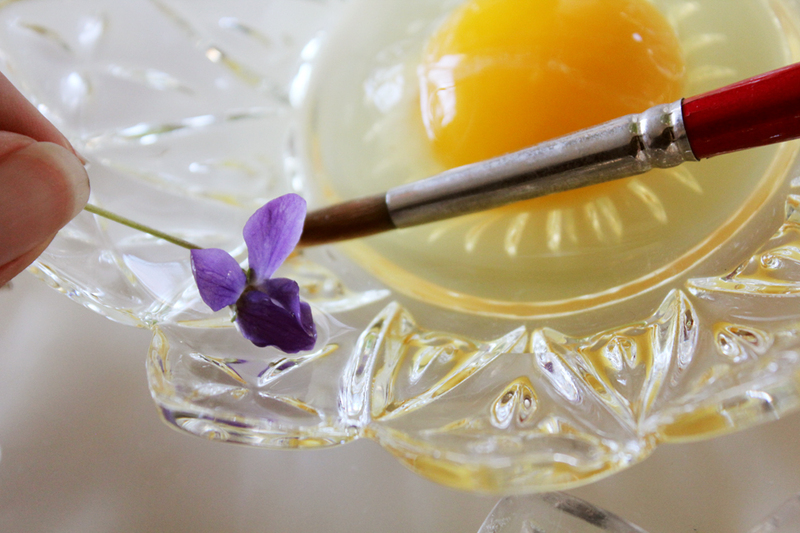 Just get your brush and brush a bit of the egg white on the flower. It doesn’t have to be all Martha complicated….sheesh! Now sprinkle some super fine sugar on it. Don’t have/can’t be bothered with super fine sugar? 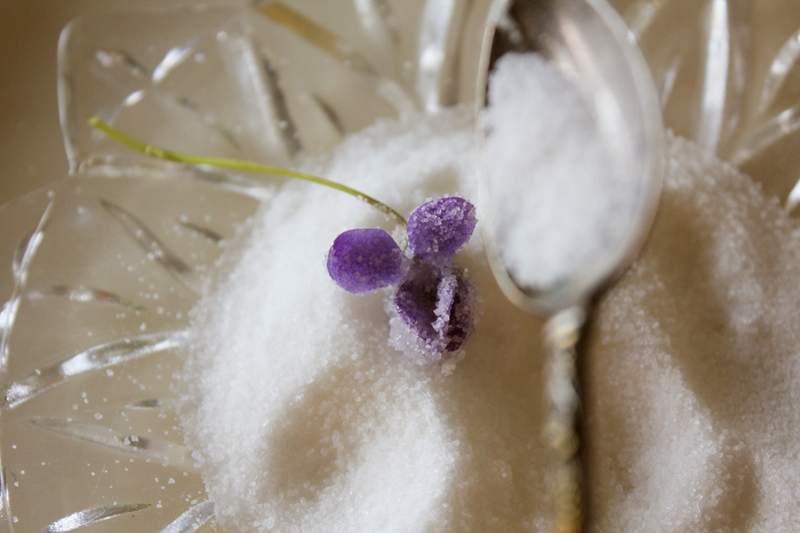 No problem, use ordinary sugar, just not icing sugar or you’ll obliterate the violet. 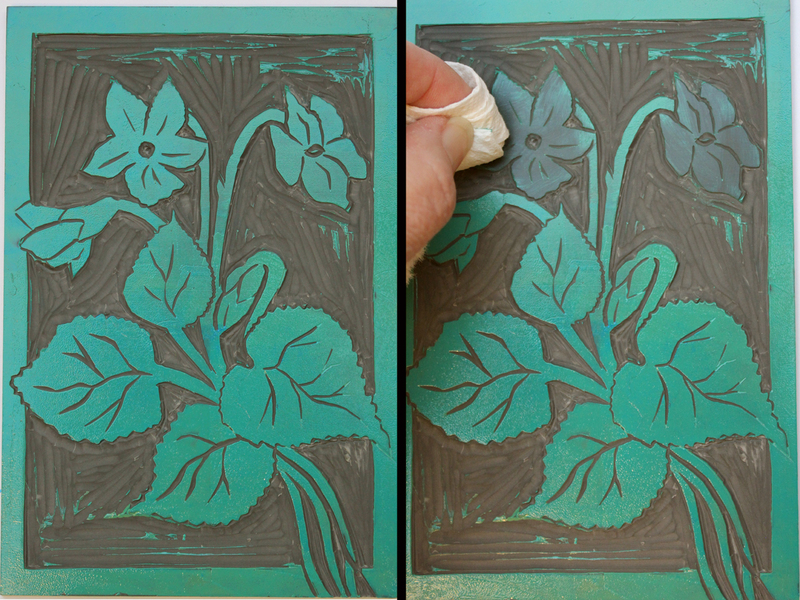 Now put it on a dry plate and snip off the stalk. 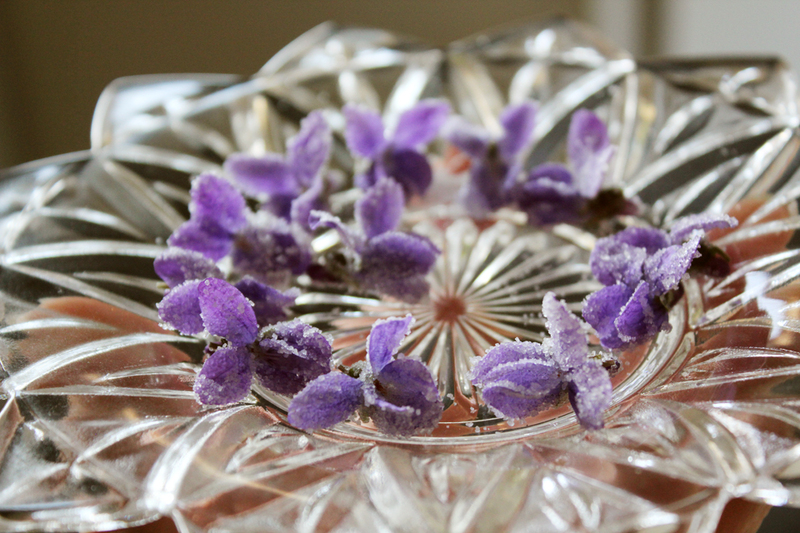 It takes almost no time at all, since we’re all a crafty and clever bunch, to get a whole plate full of sugared violets. Now they just need to go in the cupboard overnight to dry. Then they can go into an airtight container where they’ll keep for a while. Not sure how long because they just never last round here. They look and taste so great on everything from ice cream to creme brulee. 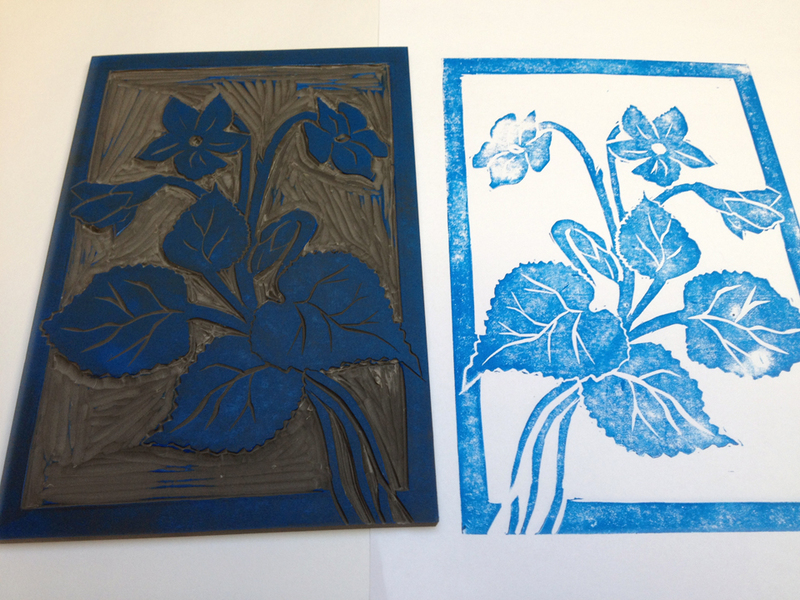 I’ve been dying to do some more lino cutting. I’m not that good at it, and the more I practice, the better it gets, so, in honour of Kers’ birthday, violets it was and a hand made birthday card to go with the cake. 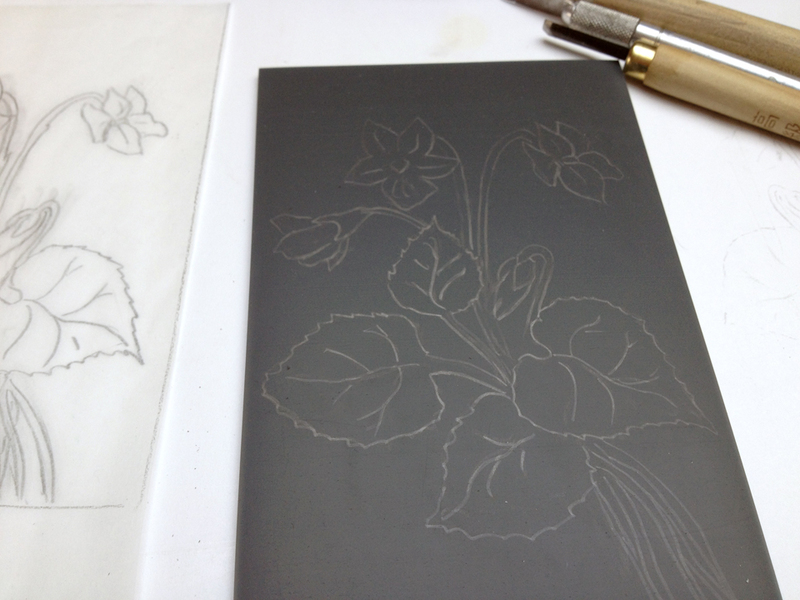 I drew some little violets on a piece of transparent paper, copied them to the back of the paper, and traced them onto a piece of lino. The pencil mark really transfers easily. 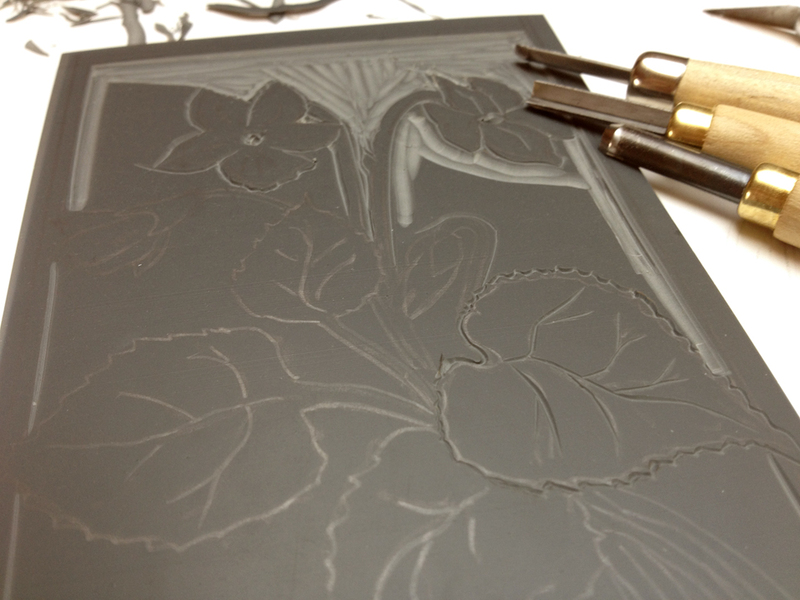 Then came the hours of cutting and decision of crossed lines and how to handle the edges…etc. I’m always so anxious and excited to do this. Like a kid in a candy store! But, after all, this is a handmade birthday card, so out came the inks, my funky plastic tray, requisitioned for an ink mixing surface, and my small roller. Please bear in mind that I have very little idea of what I’m doing…and I should really go and bug our Patrice for some advice…either that or learn reduction lino cutting…but I have a very limited amount of patience…and inks, and so I decided to mix a few inks and go for a sort of green. 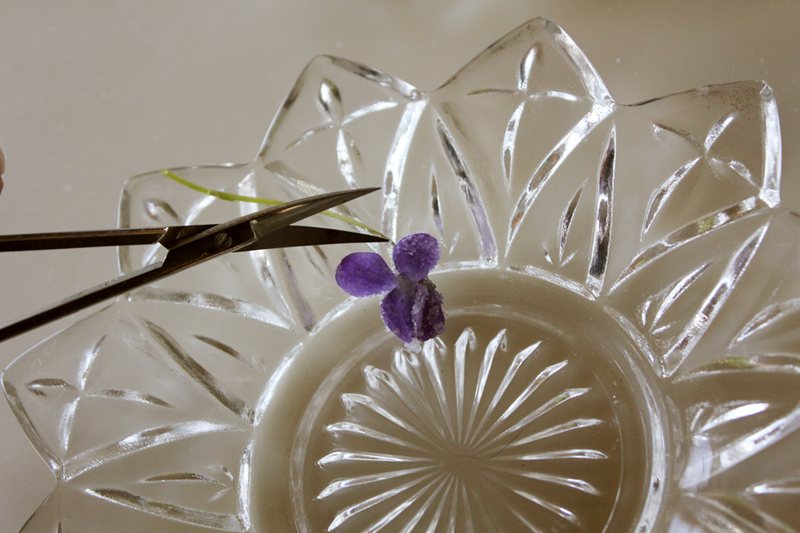 Then I decided to wipe off the green from the violet blossoms. Now what? 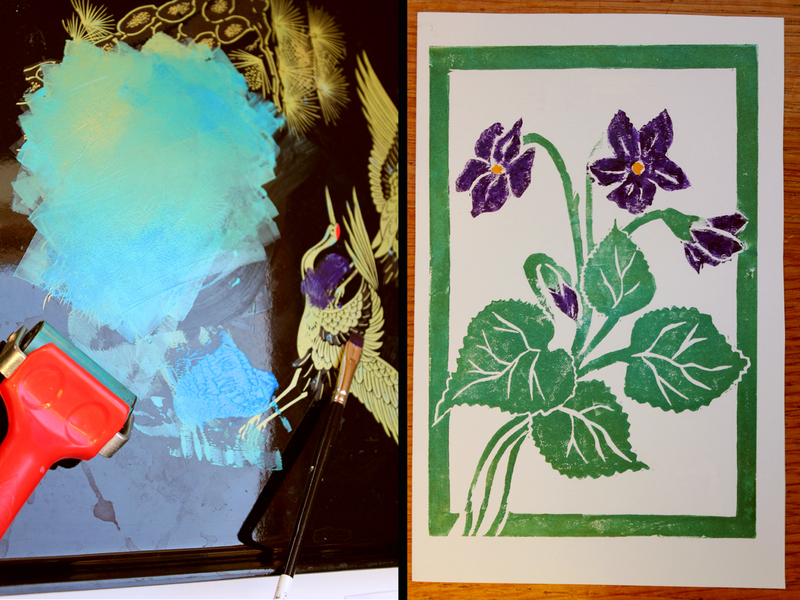 I don’t have a super small roller, can’t be bothered with figuring out how to make a mask, so I dragged a firm oil brush into some purple ink and applied it to the blossoms. 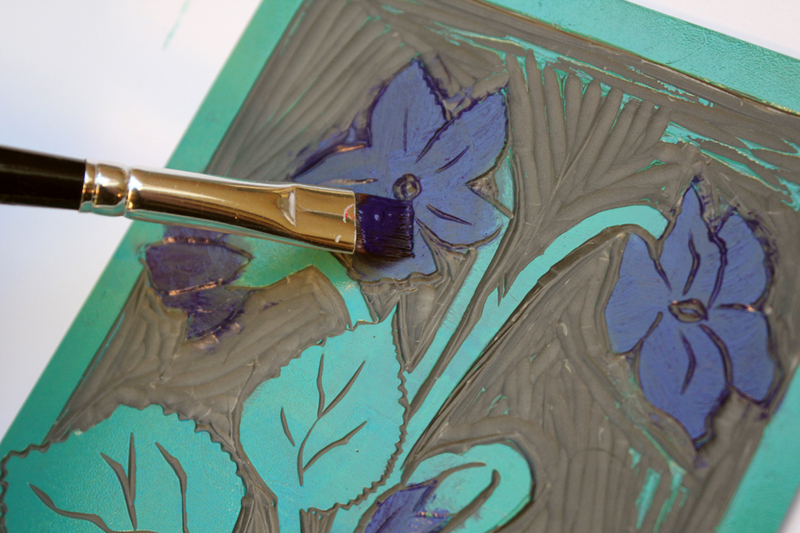 One ink mess on the tray, one bespoke violet birthday card. Come help blow the candles out on Katrin’s cake and wish her a happy birthday and then stop by the gang and share a slice! veronica, your posts are a joy to read. 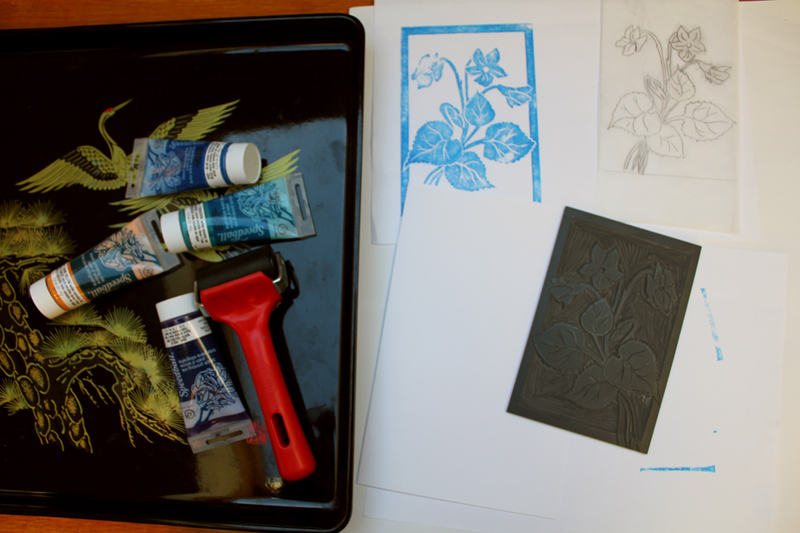 i am interested in printing lately and this clarifies some for me. besides this you are one terrific mom! so thoughtful and completely inspirational. you did good, woman. i always love the little (what you call, but sincerely are not) imperfections. applause!! wonderful joyful post, i’m waiting for the violets too, they spread themselves through my garden and surprise me each year again. I love the way you follow your instincts and create something beautiful. Those violets are so precious! What a gift, all of it. Love that you teach us, by example, to relax and enjoy the process. Artwork is typically fraught for me (I note & dote on every ‘imperfection’), but I’m learning, a little at a time, to think of it as playtime. What an informative post! Happy Bday to your daughter! Thank you for the inspiration. 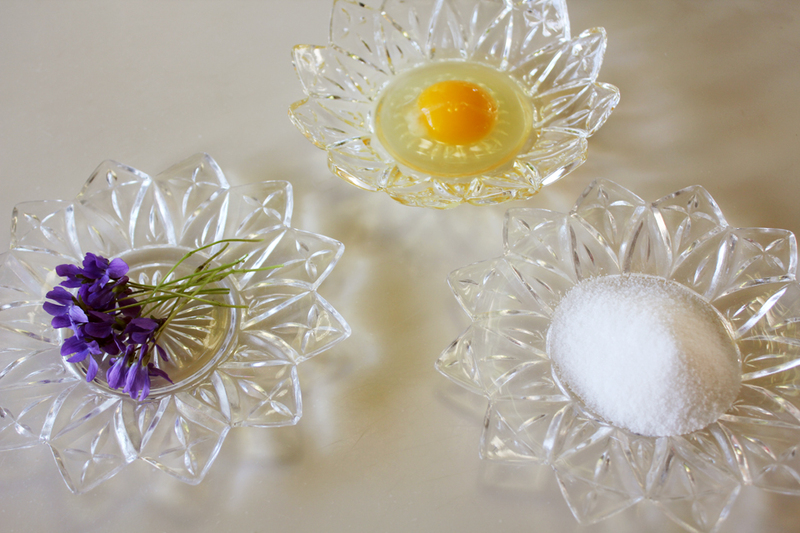 Our next birthday cake will have edible flowers! I’m very impressed! Violet flowers to eat? I will try! Thank you for this nice birthday flowers and your lovely post!